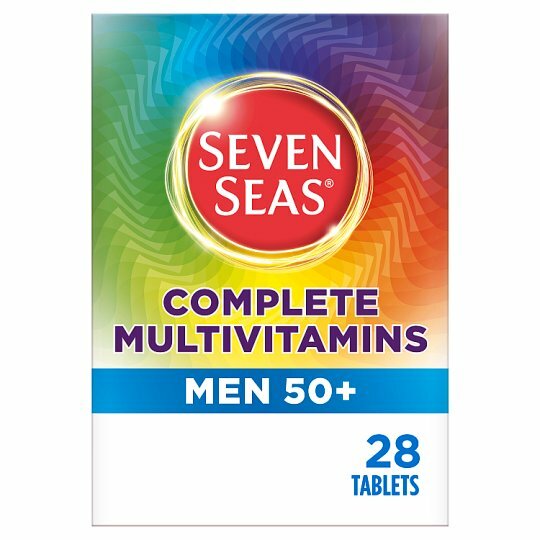 Seven Seas Complete Men 50+ Multivitamins are a complete A-Z blend of essential vitamins with minerals at levels tailored for daily health maintenance of men aged 50 and over. The formula provides seven key benefits to help men aged 50+ get the most out of life every day, and includes the energy-yielding properties of Vitamins B6 & B12 to support your get-up-and-go! Keep out of reach of young children. This product contains Iron, which if taken to excess may be harmful to very young children. Keep out of sight and reach. This product contains Vitamin A and 6 mg of Caffeine, women who are pregnant or planning a pregnancy should consult a healthcare professional before taking this product. Food supplements are intended to supplement the diet and should not be regarded as a substitute for a varied diet and a healthy lifestyle.